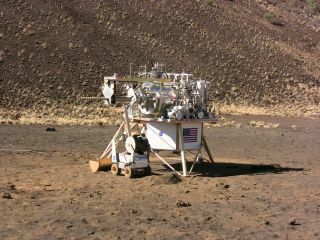 The PILOT system, or Precursor ISRU Lunar Oxygen Testbed, is shown with Lockheed Martin's Bucketwheel on a lander. PILOT could produce up to one quarter of the oxygen needed to sustain a crew of four on the moon. Protecting future astronauts from radiation, generating power from the sun's light and heat, and creating better optical sensors are some of the top 16 needs NASA focus on in the next five years, a new report suggests. The National Research Council released the NASA-commissioned the space technology roadmap report Feb. 1, after a year of analysis. The report is designed to give the agency feedback on draft roadmaps they submitted in 2010 and to help the space agency prioritize its research. The council took into account NASA's "likely" level of funding for new technology, approximately $500 million to $1 billion a year. "The agency wanted to get a sense of what the technical community thought were the high priorities," said Raymond Colladay, chair of the report committee and owner of a space consulting company, RC Space Enterprises Inc. "There were so many [possible technologies], I think NASA knew that they had no hope of accomplishing progress in all of them. So they just asked us to prioritize." The NRC briefed NASA's Office of the Chief Technologist on their space technology findings early in the week, said Lorin Hancock, a council spokesperson. Though flight demonstrations are expensive, the National Research Council report encourages NASA to test-fly technologies that are nearly ready. One example is technology for handling and storing super-cold cryogenic propellant in low gravity. Another is the Advanced Stirling Radioisotope Generator, which provides power for deep-space missions from the heat of radioactive decay of plutonium-238, using a quarter of the plutonium that previous generators required. The report warns, however, that the U.S. should restart its supply of plutonium-238, or "it will be impossible for the United States to conduct certain planned, critical deep-space missions after this decade." The National Research Council has been worried about the United States' plutonium-238 supply for several years now. On the other end of the spectrum, NASA should save 10 percent of their budget for technologies in their earliest stages, the council said. NASA is now asking for "American citizen-inventors," "educators working out of their garage" and small-business owners to submit their futuristic ideas, said Michael Gazarik, director of NASA's Space Technology Program in Washington, D.C., in a statement. Promising proposals could get up to $100,000 from NASA. Overall, NASA should cooperate more with other groups, Colladay told InnovationNewsDaily, a sister site to SPACE.com. "Because of scarce resources in this climate particularly, NASA needs to work closely with other government agencies and industry and universities," Colladay said. The agency should also work with commercial space companies, the report suggested, and it should also make its scientific and engineering findings available to companies that don’t partner with NASA and may be working on technology that doesn't apply to NASA's space missions. The panels that contributed to the 400-plus-page report included dozens of scientists from universities, private companies such as Lockheed Martin, and research groups such as the Smithsonian Institution. The report also considered public input—the first such roadmap to do so. The council solicited input from noncouncil scientists and other space experts in meetings in 2011 and in online comments from around the world. By focusing on these high-priority research problems, the council hopes NASA will regain its position at "the frontiers of technology," where it believes NASA has slipped lately, Colladay said. It also hopes that the U.S. agency will work especially on exploring space in manned missions. "Human exploration now is a component that really will push our space program to a new post-Apollo, post-Space Station era," Colladay said. This story was provided by InnovationNewsDaily, a sister site to SPACE.com. You can followstaff writer Francie Diep on Twitter @franciediep, and InnovationNewsDaily @News_Innovation and on Facebook.